Clinic Description: This Crozet Sports youth soccer clinic is a high-level instructional format designed for players of all levels of skill and experience. 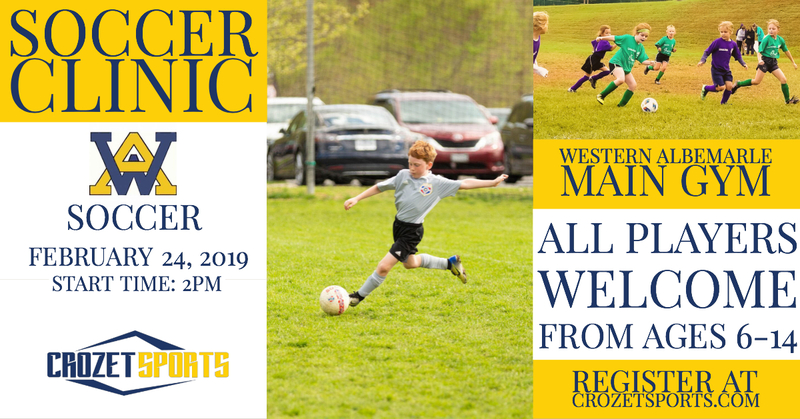 Players will have the opportunity to work with the coaching staff and players from both the boys and girl soccer programs at Western Albemarle High School. This a great opportunity for youth players to work with state championship caliber programs and receive instruction that will help them improve their game and get to the next level. What to Bring: Athletic shoes, shin guards, water bottle and a positive attitude ready to learn! Briefly describe the player(s) skill level and playing experience? Please click Submit and then select Buy Now to make a payment. Thank you!